Show us the area(s) of concern and we will perform a free limited inspection that is usually non-invasive. Many times these areas require only small local, low cost treatments. Letting these existing problems compound over time does not make good sense. With Alpha's Termite Radar, we can now detect all infestations inside your walls. You no longer have to tent to eliminate termites. Your second most important asset you have!! ...of course, your family is first. Here at Alpha Ecological Pest Control we pride ourselves in giving our customers a professional and friendly service together with advice based on what is right for you. Each home owner has different needs and requires an idividual approach to their pest management. One thing they all have in common though is the need to have regular termite inspections. The building code highly recommends 6 monthly and no longer than 12 monthly inspections of properties. Here in Alice Springs we highly recommend 6 monthly inspections for high risk properties. How do i know if my home is high risk you ask? 1. Is your home built on a slab? 2. Are the walls built with a timber frame? 3. Is your roof truss made from timber? 4. Does any timber contact the ground and attach to the house? 5. Has it been more than 12 months since your last inspection? 6. Does your property have large trees or are there any nearby? 7. Has there been any previous termite treatment done? 8. Are there any garden beds adjacent to the home? 9. Is there any prolonged moisture (leaks etc) around the home? 10. Are you aware of any neighbours that have a problem? Alpha termite control services Kenya provides premier termite control in Nairobi and all-over Kenya for both home-owners and businesses to protect their properties. Termites are of great value in nature as they help break down cellulose and create rich soil. Fallen trees and old logs are broken down into nutritious soil enrichments. But when termites get near or into our structures, they must be controlled. Termite extermination, annual cost of termite damage to buildings in KENYA is greater than that of fires, storms and floods combined according to researchers. Termites is the common name of a group of chemically complex insects that live in communities as ants do. They have long been known as white ants however this is not entirely accurate for termites are like ants only in their habits of living together and that they are small in size. Actually termites are more closely related to cockroaches and grasshoppers. Termites digest wood, paper , and other material containing cellulose, with aid of protozoain their bodies. They do much damage in tunnelling through the wood work of houses destroy books and furniture , and do great damage by tunnelling through fence posts, trees, timbers of wooden buildings, bridges ,trestles , and other structures. In houses they eat, cloth furniture, books and paper. If there are termites in the building, at the time of chemical soil treatment, they cannot safely return to their central colony nest through the chemically treated soil. 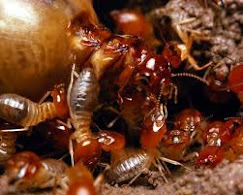 Termites are compelled to return every few days to their central colony nest in the ground to obtain moisture essential for their survival and to feed and groom the nymphs (young termites), the king, queen and other termites. Subterranean termites may build such a nest in a roof or wall cavity where moisture is regularly supplied, say from a leaking shower recess, broken roof tiles, faulty guttering or plumbing. Termites tunneling in the Premise treated soil area abutting the building (of high concentration - near the point of application) are killed outright. Termites tunneling in the outer parts of a Premise treated soil area (of low concentration) will not detect the Premise which adheres to their bodies and has a delayed lethal effect of several days - enough time to be transferred back to the central colony nest. The Premise active adheres to the termite exoskeleton and is readily adsorbed through the exoskeleton and into the termite's body to immobilize and kill the affected termite within a few days. 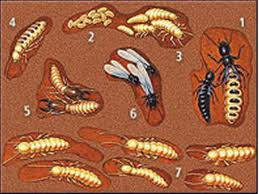 The termites spread the Premise to other termites during regular physical contact, particularly when working together in close proximity, grooming and feeding the rest of the colony, a regular function of their daily lifTermites carry away or cannibalize other dead termites, further spreading the deadly effect of the Premise chemical throughout the colony. The Sentricon termite monitoring and baiting system was developed by Dow AgroSciences, USA. The Sentricon bait is an insect growth regulator, which is designed to be spread throughout the colony by the worker termites. 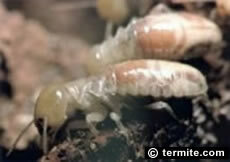 An insect growth regulator affects termites by stopping the molting process required for the termites to grow. As the worker termites die off, the termite colony declines to the point where it can no longer sustain itself, ultimately leading to it's collapse and elimination. 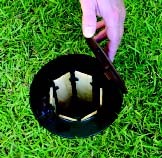 Both Sentricon and Exterra systems have their own plastic bait stations which must be used with their product. These bait stations can be placed in the ground and checked regularly. Termite colony elimination in favorable circumstances may take several weeks to a few months. However, in some cases, termite colony elimination is unsuccessful or may take years, depending on the circumstances. Where a large number of termites find and consume the bait, then colony elimination is virtually assured within a few months. This is where the experience and skill of the termite controller is paramount to decide if and where a baiting program is implemented and properly monitored. The Sentricon termite baits are designed to be slow acting, non-repellant and therefore spread to other termites in the colony before the colony can detect where the deadly effect is coming from. Sentricon termite baiting systems are subject to regular inspection and monitoring by the termite controller. The larger the number of termites that consume the bait, the quicker and more certain is the termite colony elimination process. It is usual to re-inspect the bait stations and the buildings and surrounds every month to reposition, reapply or replenish the bait, if necessary. This process is labor intensive so. that the long term cost of the monitoring / baiting system may accumulate out of hand before the chance of success or otherwise, is realized. One critical aspect is the bait stations should to installed in areas where termites are more likely to be foraging. The termites must "find" the stations to have any chance of success. The Sentricon baits are placed in their in-ground bait stations after removal of the termite infested timber therein. This may involve sufficient disruption of the termites such that they avoid the in-ground Sentricon bait station, entirely. This serious short-coming is overcome by the patented Exterra Termite Stations where the timber is aligned around the cylinder such that the bait can be inserted without such disturbance of the termites present. RECOMMENDATION: Sentricon be used where a complete chemical soil barrier treatment using is not practicable or desired, and where a several thousand termites are likely to eat the bait. A termite monitoring and baiting program can be integrated with a range of methods including (1) drilling susceptible trees and eradication of any termite nest located therein, and (2) in conjunction with a follow up chemical soil treatment using Premise. Removal of any timber in contact with the soil. Timbers should be stored above ground to allow full inspection of subterranean termite activity (coming from the soil thereunder). Any landscaping using timber chip mulch and railway sleepers should definitely be removed, as they provide ready food source to assist in rapid termite colony development. Ensure inspection access is unimpeded, particularly in sub-floor areas (suspended floors) in order to look for evidence of termite activity. If your property is on a concrete slab on ground flooring, make sure you can inspect the entire external slab edge for evidence of termite mud-shelter tubes. Do NOT allow this area to be covered by pavers, landscaping, planter pots, etc, as termites often gain entry into the walls of a building via this locality, particularly through external weep holes and minute gaps in the mortar in brick-work. If you find live termites or termite damaged timbers DO NOT disturb the area. 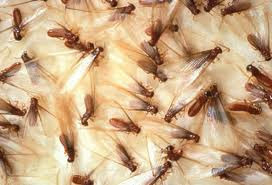 DO NOT use spray can or insecticides on the termites. If sufficiently disturbed, the termites are likely to move elsewhere, and may not be rediscovered until further obvious damage has been done. The termite controller can introduce Intrigue termite dust or termite bait directly to the live termites present in an attempt to eliminate the entire termite colony - as discussed in detail above. CONSUMER NOTE: the installation of a chemical soil barrier does not negate the need for regular competent inspections - at least 3 to 6 months where the termite risk is high. We usually recommend 3 or 6 monthly inspections be carried for the first 24 months following a chemical soil treatment. Monitoring of "stand-alone" baiting systems should be carried out every 4 to 6 weeks. The Sentricon® Termite Colony Elimination System revolutionized termite protection when it was first introduced in 2005. Not only does the system efficiently and effectively protect your home investment for the harmful effects of termites, but it also provides an environmentally friendly alternative for termite control. Instead of spraying the ground with liquid termicides, the Sentricon® Termite Colony Elimination System with Always Active™ technology uses Recruit® HD termite bait to eliminate termite colonies by attracting termites to the bait then allowing the bait to eliminate the termite colony. Recruit® HD termite bait is preferred by termites over wood, so they devour it faster than wood, and find it even more desirable as the bait ages. Also, only a few grams of ingredients are used in each station to prevent environmental damage. The active ingredient in the Sentricon System is registered by the EPA under the Reduced Risk Pesticide Initiative. This initiative helps to provide low impact on the health of humans and wildlife while also providing a low probability of groundwater contamination. Alpha ecological Pest Control is proud to provide the Sentricon® Termite Colony Elimination System to protect our client's most important investments while also providing the best possible option for our environment. To learn more about the green aspects of the Sentricon® Termite Colony Elimination System watch the video below or click here.